We’ve been doing a lot of work lately around Ohio with new website clients that want us to help them rank better in the search engines. These are not huge, aggressive campaigns but simply clients that want to test the waters of what a little quality SEO can get them. They simply want to be on the radar instead of lost in the Antarctica of the web. When we take on these projects we usually work with an existing website design, we don’t create new content, we don’t go above and beyond, but we do perform some fundamentally important improvements to the website that create a very solid foundation. It involves research, using that research properly, improving the code on the website and generally “optimizing” the existing site so it’s, well, optimized for the search engines who have to digest what the site is about and then turn around and determine how relevant the site’s content is to thousands of search queries. The results we can get by having our clients make a small investment in their website can be extraordinary. 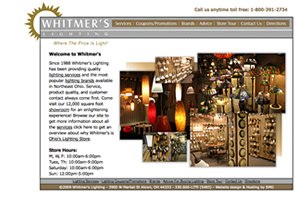 The search engine optimization client that I’d like to feature here is Whitmer’s Lighting in Akron, Ohio. As you can probably ascertain, they deal with lighting (residential, commercial, outdoor, etc. ), basically any type of lighting that you might need – and much more than you’ve probably never thought of. They are a huge Ohio lighting store that has few peers. So what they hired us to do was take their existing website and get some results. The budget was limited and the expectations we’re low but we came through with results that went through the roof. Remember, with a basic website optimization our goal is to get the client on the radar for their key terms and locations. 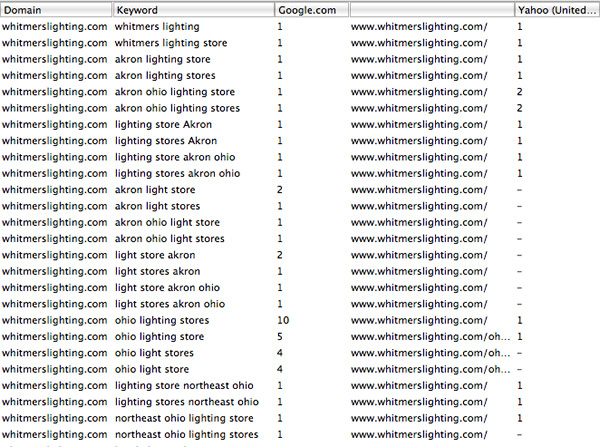 In this case our goal was to have the client show up for searches that showed someone searching for a lighting store in Akron, Ohio. So consider it. You don’t have to spend thousands a month to compete and have a presence online. You can get yourself on the radar with with a basic website search engine optimization with a relatively small investment. Then, after you see the results, let us take it to the next level. Please call us today for pricing and a free consultation.